I had some cauliflower in the fridge and homegrown tomatoes that would not last through the weekend, so this happened! Toss some tomatoes and cauliflower with garlic, olive oil, salt and pepper. Roast until tomatoes turn saucy, stirring once or twice. Sprinkle with basil. Put it over some grains and/or put an egg on top. Maybe add hot sauce. Don’t measure or time anything because you’re trying to pack at the same time before the baby wakes up. Call it brunch. I was on the quest to make the perfect jalapeño margarita – heavy on the spice and light on the sweet. Maybe you are, too? Great news! You can stop your search down the Internet rabbit hole and make these tonight. They were the perfect start to a summer night that included guacamole, jalapeño corn muffins, Mexican street corn “salad”, veggie fajitas with jalapeño cashew cream, fantastic friends, and Los Lobos. Then, prepare another glass – this one can be smaller: Use a lime wedge to coat the rim of the glass, and then gently dip in a shallow bowl of coarse salt. Fill that glass halfway with ice. Use a small strainer to pour the liquid from the large container to the small container. Garnish with a lime wedge and a jalapeño ring. Umbrella optional but recommended. Looking for a perfect* summer dessert? Stop googling and start making this. This particular crisp was made from peaches purchased at Sweet Corn Charlie’s stand in Syracuse, Indiana. They were the kind of peaches that were begging to be eaten–perfectly fragrant and just soft enough that if we let them go another day they would have turned to mush. This is a simple recipe with ingredients you might even have in your pantry and fridge. You can even make it ahead and keep it in the fridge until you are ready to bake it. The hardest part is remembering to turn on the oven before dinner so you can pop the crisp in the oven while you eat. My suggestion is to serve it with some vanilla ice cream**, but then again my suggestion is to always serve everything with some vanilla ice cream. Thanks to T for creating this with me and remembering that very important step to turn the oven on. This recipe comes from All Recipes. *By perfect I mean one that does not take your time away from having lots of summer fun outside. **That is, unless you already had a root beer float 2 hours earlier because you were trying to fit an entire summer into one day. Arrange peaches evenly in 8X8 baking dish. Mix flour, sugar, butter, cinnamon and salt in a bowl. Mix in the oats. Sprinkle and press topping into the peaches. Bake for 30 minutes, or until topping is browned. Are you tired of sautéing or steaming your green beans? Well, the temperature finally dropped below 80 degrees, so now is a great time to make some soup. This is a protein-packed vegan soup with a mild flavor and very few ingredients. Thank you to Chocolate & Zucchini for this wonderful recipe, which I adapted only a little bit based on what I had in my fridge this morning! Heat the oil in a medium heavy-bottomed soup pot. Add the onions and carrots, and cook over medium heat, stirring every now and then, until softened and very lightly golden. Add the garlic and stir for minute. Add the green beans to the pot, season with salt and pepper, and cook for 5 minutes, stirring from time to time. Pour in the broth and water, bring to a simmer, cover, and cook for about 20 minutes, until all the vegetables are soft. In the meantime, pour the sliced almonds in a dry skillet. Set over medium-high heat and toast for about two minutes, stirring constantly and watching closely, until golden and fragrant. Set aside in a bowl to prevent overtoasting. When the vegetables are soft, add the almonds to the pot and stir well. Remove from heat and let cool slightly. Use a high powered or immersion blender to mix all ingredients until velvety smooth. Taste, adjust the seasoning, reheat over gentle heat if necessary, and serve. Sometimes G goes on a ketchup, butter, and bacon diet, like at dinner last night. Then I wake up the next morning and try to do some damage control. Enter Greek Yogurt Ice Pops. Thanks to CB for the inspiration! I used blackberries and peaches because that’s what was at the Carroll Gardens Farmer’s Market yesterday, but you can use any fruit/yogurt combination. Why not put in some greens, too? We did rainbow pops last year without yogurt and those are just as delicious but in a different vegan sort of way. It depends on what you’re in the mood for. If you want to know more about these freezer molds, check out that post. Combine all ingredients in blender and blend until liquified. Add more water to thin as needed. Freeze for at least 4 hours. Enjoy! BONUS: If you have a toddler, this human can help you with every step of this process. G especially liked putting the handles in the molds like a little puzzle. Here’s another way to preserve the jalapeños that are taking over my rooftop. If you don’t have this problem, its worth buying a whole bunch of hot peppers so you can make your own spicy sauce, which is much better than anything you can buy in the store. I only slightly modified yet another incredible recipe from Karen Solomon’s Jam It, Pickle It, Cure It. This recipe makes about 3 cups and the sauce will last in the fridge for 6 months. Warning: Wear gloves and work in a well-ventilated area when working with jalapeños. Wash and dry the peppers and cut off the stems. Slice them in half lengthwise. Broil, outside skin near flame, until black and charred. Check the every few minutes as once they start charring, they turn black pretty quick. In a food processor or blender, puree the garlic until minced. Add the peppers, salt, vinegar, and sugar and puree for about 3 minutes. If you have a high power blender, just run all the ingredients together for 1 minute. Transfer to a glass jar and refrigerate. This comes together in a snap with just a few ingredients, and it disappears even faster. It’s a great way to use day old bread. Put the cubes of bread on a baking sheet lined with parchment paper. Drizzle bread with 1-2 T olive oil. Season with salt and pepper and stir. Put bread in the oven for 10-12 minutes until croutons are toasted. Allow to cool for a few minutes. Combine tomatoes, garlic, shallot, vinegar, remaining oil, and salt and pepper to taste. 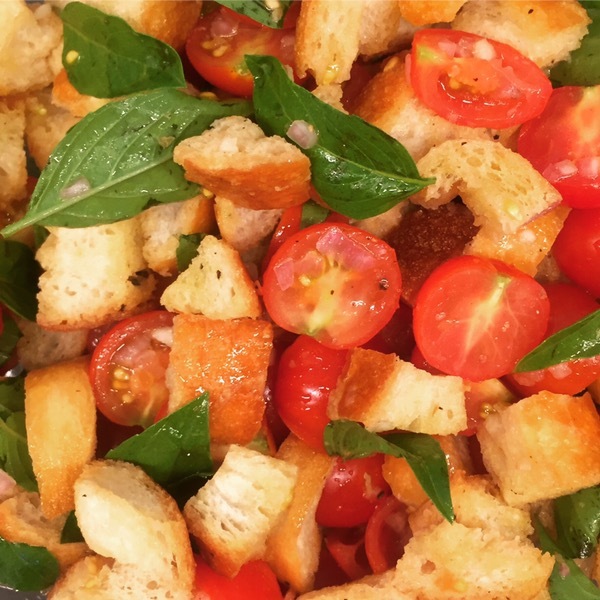 When the croutons are cooled, combine basil leaves and bread with tomato mixture.